By writing this document, I am hoping to awaken the reader to the incredible opportunity we have at this time to prepare for our impending Earth Pole-shift. The Earth Poleshift is a physical-axes-repositioning (explained @ “The Pole-Shift Event, below). It is not a “magnetic pole reversal”, there is no such thing, that is a lie, disinformation brought forward by secret government agencies who do not want you to know about the Earth Pole-Shift. These hidden workers seed lies, half-truths and strategically employed convoluted factoids to take the publics attention from discussion of the Pole-Shift, otherwise known as a Physical-axes-repositioning or Crustal-Shift. Yes, our magnetic North has been slowly moving and has even accelerated in the last few years, but this is more a concern of commercial air flight, airports and their runways than for the general public. During an actual Pole-Shift, new geography is shifted to the North and South earth-spin-axes points. What this also means, is that massive waves from the ocean will assault the shores of the world once the Earth has finished it’s irreversible 90 ° tip. As most people may know, the majority of Earth”s population inhabit land next to the sea, this is why most of the world’s population is susceptible to the unimaginable pre Pole-Shift flood tides and eventually the 500 to 600 foot ocean waves rising and moving beach-ward at conclusion of the Pole-Shift proper. The opportunity we have at this time is unprecedented. When you consider the effects of the Pole-Shift being massive world-wide Richter 15 earthquakes and an ocean wash up to 800 or more feet from sea level world-wide, not-to-mention, the flying rock from the tail of Planet X, you have to know that destruction of all man-made structures is most certain. Yes, there is hope and an opportunity to survive and survive well, but the reader must be prepared, so this is the intent of this document. The Months Prior to the Pole-shift. In the months before the earth Pole-Shift, almost all government and commercial services we have come to expect will be interrupted and be periodic at best, this is why the time we have now is so precious. Interruptions will increase and worsen as the time of the Pole-Shift approaches as government agencies will not be able to fully respond to the massive earth-change events unfolding: meaning that the escalation of the many growing petitions for assistance will never be fulfilled due to the shear volume of need. “When Planet X or Nibiru is visible by the naked eye near the Sun, all will be clear. You will know deep down that something massive and unimaginable is about to happen. Dream-like, you will be guided, as such a great and wondrous time of change will bring forth the very best in people and the very worst of some of those who cannot accept what is happening. In other words: those who are seeking a better life will be assisted in ways not understood at the time and those who resist and detest change will be assaulted by their own life energies and will act-out. Fear-not, for those who love Life will be protected and guided to where they need to be to best survive the coming on-onslaught of the tail of Planet X and the Pole-Shift itself. Brief overview: Planet X passes close to Earth on it’s way out of the solar system, it magnetically grabs hold of Earth’s South pole and arbitrarily repositions (drags) it “to the left” approximately 90 ° within one hour. During that hour, Earth will be assaulted by rock and dust from the tail of Planet X causing all sorts of unbelievable effects. In the weeks prior to the pole-shift, Earth will be fraught with other issues such as a temporary “upside down” Earth as it responds to the powerful magnetic bully: Planet X slowly moving across the sky and Earth rotation-stoppage signaling the nearing Pole-Shift. A stopped Earth causes world-wide ocean water to rush to the poles to equalize it’s distribution due to the lack of centrifugal force at the equator. So leading up to and including that last week, sea tides will be highly unpredictable, thus dangerous. Your calendar of events prior to the Pole-Shift. 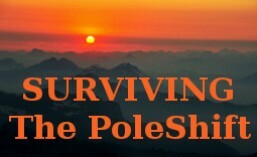 The good news is that the Pole-Shift event-time will advertise itself very well beforehand giving us plenty of time to get under cover for the main event. Migration to your safe locations should be done well beforehand to avoid the upheaval and blockages of roadways and downed bridges on-route to your safe location route. Read up on your new longitude and latitude! Why is this important? Well first of all, your After-Time (local) geography will be placed in an entirely different longitude and latitude after the dust has settled. It is important to understand where your local town is moving so you can properly prepare for the new weather conditions that will be obvious within weeks of the After-Time. So consider the fact that the new North Pole will be off the coast of Brazil and the new South Pole will be near the southern tip of the Indian continent. Since orientation to the poles will have been entirely changed, it’s critical to refer to here for your local Pole-Shift details. Once Planet X has passed, rebuilding will start, but with what tools and material? This is why it is so important to buy all you need beforehand. During the Pole-Shift you will be so busy preparing, so do not forget to have the equipment close at hand for hot food and drink for the immediate After-Time. Blankets, food, drink, music and good fellowship will be the best way to start your After-Time. Your After-Time experience will depend on you, the reader. Appropriate preparation is king, for the After-Time experience is only but how you prepare for it, this is certain. Many people think they have prepared, but these individuals are sadly mistaken, for many have fallen prey to the many opinions on the Internet, their preparation is evident by the lack of knowledge that prevails. The After-Time will exhibit many new conditions the lazy have not prepared for, such as no government services or help, local conditions impossible to expect, such as rock-fall, blocked roads, ocean currents never before seen and weather that has not been anticipated, even the sky will appear differently from what you have ever seen, so all this will contribute to stress, therefore frequent rest will be needed for those first weeks after the Pole-Shift. Preparing for the After-Time is far more than just gathering food, tools and material and seeking high land for survival against the Pole-Shift Ocean-wash. Additionally, many people have needs beyond what the average survivalist requires, so careful thought needs to be put into both your provisions and your choice of survival location. Not only this, but it is so important to seek others of like mind prior to the Pole-Shift and plan together how you want your life to be. Others will have different opinions, this is good as the more viewpoints the better. Once the actual Pole-Shift conditions are clearly understood, those in your group will be able to align their opinions for the betterment of the group. After the weeks have passed when those in your group have settled down to a routine, those who are strong will need to do some local reconnaissance and establish routes of safe travel and areas that contain food for foraging. Still, those people who have special needs will need caring for, so any of those capable may choose to seek these people out and offer assistance. The good news is that all After-Time life will be devoid of government and corporate interference and a new life of freedom will be standing before you for enjoyment! Now all After-Time events will be recorded in the Akashic record, so take care to extend the very best in concordance with the highest sense of self! After-Time life will be punctuated with great celebration but will mainly consist of hard work; a life for any man or woman of Soul, for such will be the subject of discussion for many, many times beyond human understanding. Who will be among those who wish they could do this again? Many will wish that these times could be again, but alas, these times will be fleeting and ephemeral against the needs of Soul once this has passed. Ultimately, the life of anyone who survives the Pole-Shift will be something of great importance compared to anything they have known as a citizen of such a depraved society as that of common life today in 2012 Earth. Such life is known to be a requirement to assail the path of Soul that is laid out before those who wish a better and superior attendance to what is understood to be of ultimate importance. All details in this document relating to the Pole-Shift are taken from http://www.ZetaTalk.com. This entry was posted in About the Pole-Shift and tagged 2012zetatalk, After the poleshift, After-Time, AfterTime, chris thomas, Earth Pole-shift, nibiru, planet x, pole shift, PoleShift. Bookmark the permalink. Is an Indiana concrete bunker as safe as high in WV mts? Hi Lissa. The first thing you need to put behind you is the massive New Madrid Fault line adjustment, which will happen many months before the Pole-Shift. If the bunker roof (concrete?) survives that, then it may be ok for the Pole-Shift. Another thing you need to be concerned about is water drainage. The Pole-Shift brings massive sheets of rain and will over-flow the banks any creek or river. Is the bunker on a flood plain or near a river? If so, it’s not safe. The bunker itself must be protected against filling with rain water like you’ve never seen before, so the entrances and exits need to be carefully inspected against flooding during the pole-shift. Also, you need to secure your exits, as much debris will be flying during the massive Pole-Shift winds: fallen trees or consider the possibility of your neighbors barn deposited on top of your bunker exit. Think of the historical prevailing wind directions for a clue on the latter. There are other hazards to consider. There will be many migrants looking for food, shelter and water, also, do you want to stay in Indiana for the rest of your life? Travel in the After-Time will be by foot or by horse cart, so distance travelling carrying your belongings will be very trying. The Pole-Shift brings volcanic ash-fall during and a dimmed Sun for a decade or so afterward, so growing low-light food or building a hot-house with grow-lights will be necessary. When inland, foraging and hunting will be a necessity as well. Otherwise, living within moving distance of the sea is a much better alternative, as the Sea will provide much food in the After-Time. I say moving distance as you do not want to be near the sea during the Pole-Shift, unless you have a high (800 feet above sea level) safe location near the sea. Please read this about Indiana. 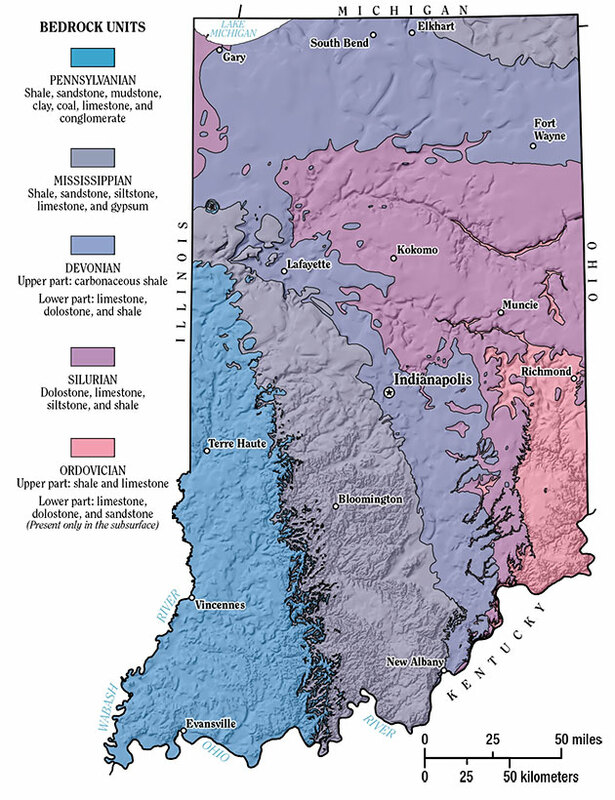 Also, check out this: geological map of Indiana, it shows the age of rock, the older the rock the harder it is, the better chance your bunker has in sustaining the Pole-Shift earthquakes. As it is, Indiana has older rock than that of the southern states. It seems you are well situated for seafood in the After-Time as the ocean will be arriving at the door step of southern Indiana within 2 years after the pole-shift. (that’s zetatalk info – based on a 675 foot sea level rise, melting poles) I have also uploaded an image of the general area you may find interesting and can send to your friends, here. Also, remember Earth and Earth-life is unified with the highest realms of God, so expect help arriving in unexpected and happy ways. My gut tells me to go as high in mts deep caves, take cover till its all over; live as natives did 50,000 years ago. Thank you for putting this information here…about the disinformation on a magnetic pole-shift, its crustal. I believe I’ll be alright.